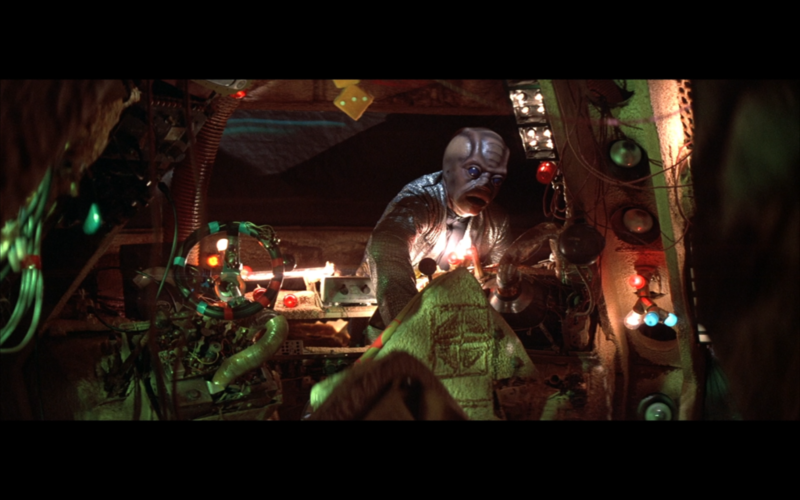 The Adventures of Buckaroo Banzai Across the 8th Dimension! 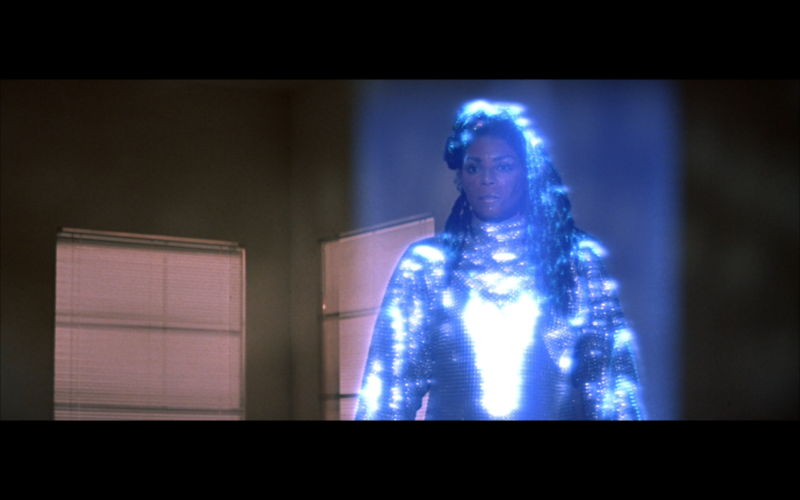 - Blu-ray Review - ReDVDit! The term “cult movie” is dangerously close to losing its meaning. Where these days it refers to a movie with any kind of appeal outside the mainstream, the heyday of the 70s and 80s saw the original surge of films we would come to know as “cult” works. Where networking and sharing knowledge of a film (much less seeing it) is, by and large, incredibly easy today, forming connections with likeminded fans of films that didn’t make it to the cineplex was a far more daunting endeavor. Sharing tapes, finding (or starting) mailing lists or even attempting to get a convention together were all hallmarks of the dedicated fandom from which the “cult” label was originally derived. This isn’t meant to diminish the significance of contemporary cult cinema, far from it, but there was an additional element to the dedication of the cult movie aficianado back in earlier periods of cinema’s history. Films like The Evil Dead and shows like Mystery Science Theater 3000, while now established and celebrated properties, languished for years out of the limelight, kept alive only by a small but dedicated fanbase. Films of that caliber, critically overlooked but beloved by a small yet often vocal minority, were rare indeed during the original emergence of the “cult” film, and today we’ll be looking at one such film: The Adventures of Buckaroo Banzai Across The 8th Dimension! W.D. 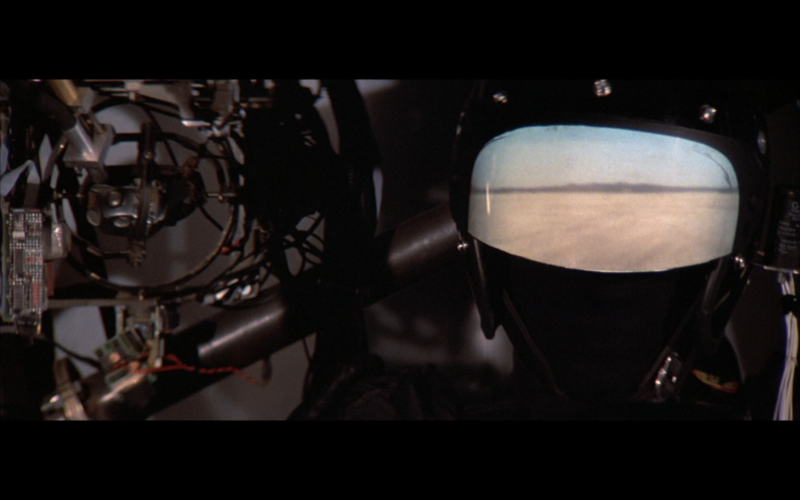 Richter’s The Adventures of Buckaroo Banzai Across The 8th Dimension! defies any sort of easy explanation, it’s the sort of film that would take an act of congress to get made today and, by some accounts from staff at the distribution company at the time of the film’s release, no one was really sure what to do with the film in terms of its marketing. Despite the film’s potentially off-putting mish mash of action, science fiction, and parody, there’s a lot to love in the picture with the cast taking top prize. Peter Weller stars as Dr. Buckaroo Banzai, the doctor / rock star / martial artist whose groundbreaking journey into the eighth dimension that kicks off the film sets him against the machinations of Lord John Wharfin (John Lithgow), exiled leader of the Red Lectroids (which include Christopher Lloyd as a scheming second in command). Alongside Buckaroo are the Hong Kong Cavaliers, his band / bodyguards / assistants / researchers, which include Clancy Brown and Jeff Goldblum in supporting roles. To round things out, Ellen Barkin plays Penny, the twin sister of Buckaroo’s deceased wife. 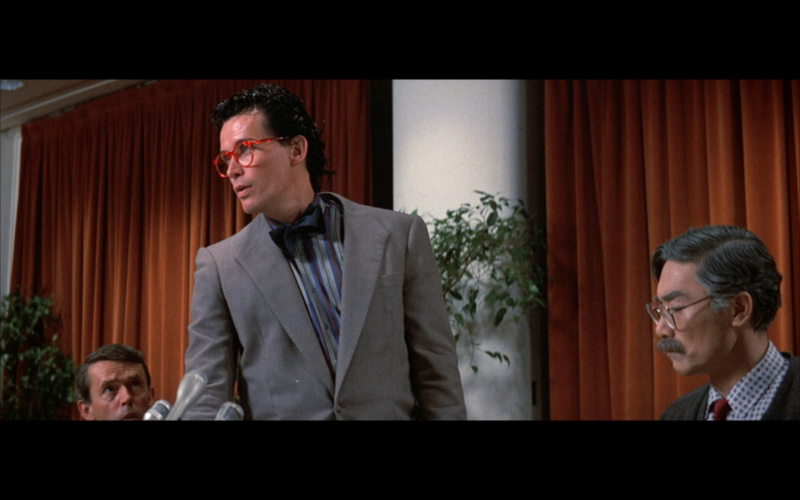 To make a severe understatement, The Adventures of Buckaroo Banzai… had a lot going on. The invention of screenwriter Mac Rauch, The Adventures of Buckaroo Banzai… was the fulfillment of years spent by Richter and Rauch to bring their creation to a wide audience, by the time they began filming, Richter was known to carry a 300 page document called The Complete Buckaroo with him, with loads of ideas and facts about the characters who, to everyone outside of Rauch, Richter, and Richter’s wife were essentially unknown. A beloved film by dedicated fans, some of whom refer to themselves by the film term “Blue Blaze Irregulars”, the first release of the film on Blu-ray was a cause for celebration. With Shout! Factory’s reputation with a barely a scratch on it, let’s see how well their release of this cult classic holds up. As I mentioned above, trying to break down this film into a concise yet all-encompassing explanation is largely an exercise in folly, so let’s see how we do. 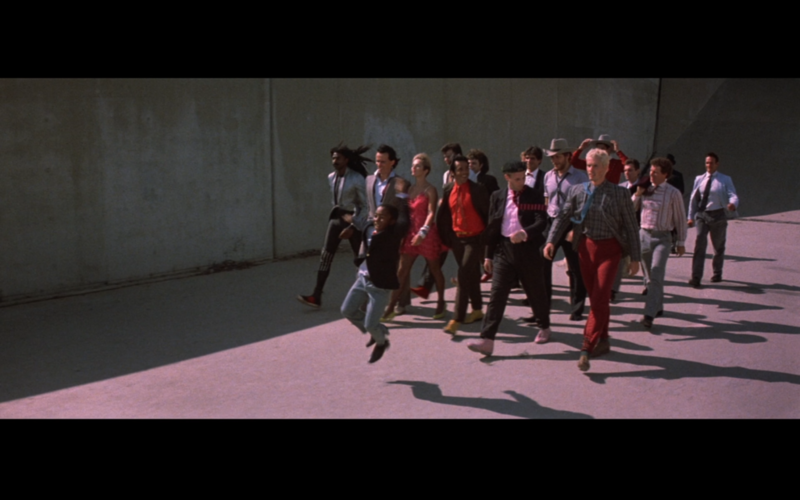 Dr. Buckaroo Banzai manages to break through the barriers separating dimensions with the help of a rocket car and his “overthruster” invention, finding himself briefly in the eight dimension (home of Lord John Wharfin’s Red Lectroids). This excursion encourages Wharfin, who has been stuck in our dimension, to renew his attempts to return to the eight dimension and take over his own world yet again. Banzai alerts the president and the press of his discovery after running into Penny, a woman who looks exactly like his deceased wife (Ellen Barkin), while he performs with his band: the Hong Kong Cavaliers. Servants of Wharfin attack Banzai in the Cavaliers in an attempt to steal the overthruster, beginning a back and forth of hostage taking and threats that dominate the third act of the film. When the denziens of the planet that exiled Wharfin to the third dimension threaten to blow-up earth if Banzai doesn’t stop John Wharfin by midnight, he has to use all of his wits to bring the interdimensional criminal to heel in time to save the world. 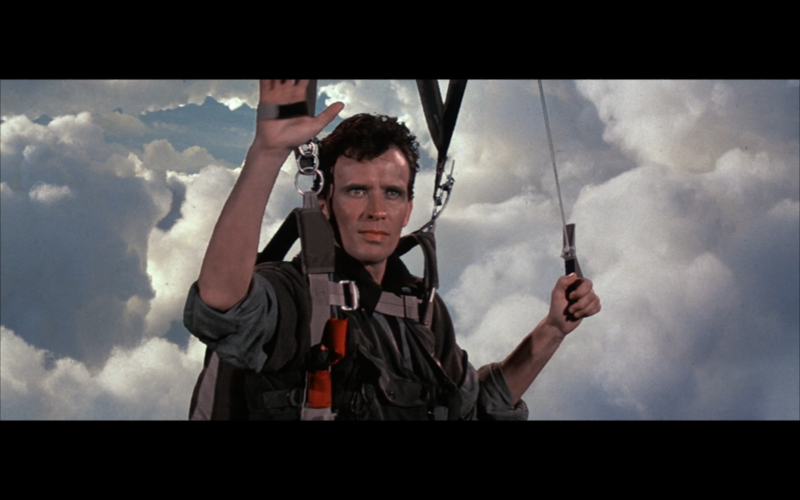 The Adventures of Buckaroo Banzai… straddles a variety of genres without ever fully committing to one or the other. If you’re unfamiliar with the history of the film, you could easily be forgiven for thinking there were previous installments in the adventures of Dr. Banzai before this film. As I mentioned above, the director and screenwriter had been coming up with stories and undeveloped screenplays featuring these characters for a year. The result is this film is overflowing with comments, nicknames, and other inside jokes that, by and large, the audience is not privy to. This is a double-edged sword as this film and its characters feel exceptionally lived in, relationships feel hammered out and reliable for Banzai and his comrades as if they’ve been through a lot together. It reminds me, to a degree, of the strong relationship between Indiana Jones and Short Round in Indiana Jones and the Temple of Doom, where previous adventures are strongly implied and referenced without being hamfisted. On the other hand, however, it can be incredibly frustrated for viewers to feel like they’ve been left out of the adventures and relationships that led these characters to come together and rely on each other so totally. 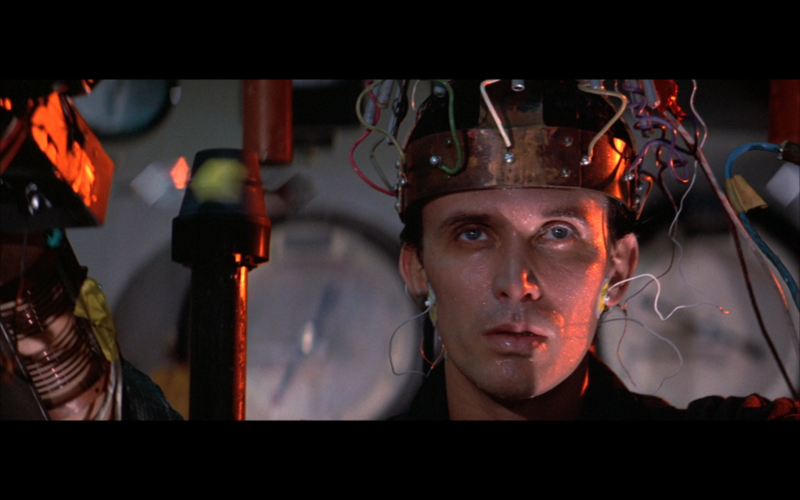 The Adventures of Buckaroo Banzai… makes its arrival in the HD dimension with a great presentation courtesy of Shout! Factory. Delivered in its original format of 2.35:1, this release is utilizing the same source print used in previous DVD editions, the HD encode is surprisingly strong with a richness to the color palette that largely does justice to this vibrant film. Whites and blacks are particularly rich. Without a new scan, the age of the print does come through with a consistent level of grain which can be distracting in close-ups, but is not outside of the norm for a print of this age and care. All things considered, the print itself is in remarkable shape having gone through no special clean-up prior to this release. This release of The Adventures of Buckaroo Banzai… features two distinct audio tracks: a stereo track that mirrors the audio of the original film’s release and a new 5.1 surround track for those who want to flex their system’s muscles. Many purists will want to turn immediately to the stereo track to listen to the film as originally intended and this mix is arguable superior. Levels are strong across the board with conversations dominating the mix, you’re not going to lose anything to effects and the soundtrack, but each is balanced out well and never overwhelms the other aspects of the mix. On the other hand, the 5.1 surround mix does have some issues with low levels, conversations don’t seem to suffer but the rest of the mix isn’t anywhere near as loud or dynamic, especially when it comes to the soundtrack. Turn it up if you opt for this track. Team Banzai makes its debut in high definition with a solid release from Shout! Factory. While this isn’t the comprehensive set that Banzai fans may have been clamoring for, there’s a lot to love in this release. This film maintains an incredibly devoted fanbase for a film that’s now 32(!!!) years old, and the quality of the print and audio means that Buckaroo Banzai and the Hong Kong Cavaliers have never looked or sounded better. If you’ve never managed to see this film and you have a taste for the offbeat, this is the edition to pick-up and I can definitely recommend this release to fans who have been holding onto their DVDs for years. Once again, Shout! Factory does right by yet another beloved film, this time a well-deserved cult classic. Take a look.